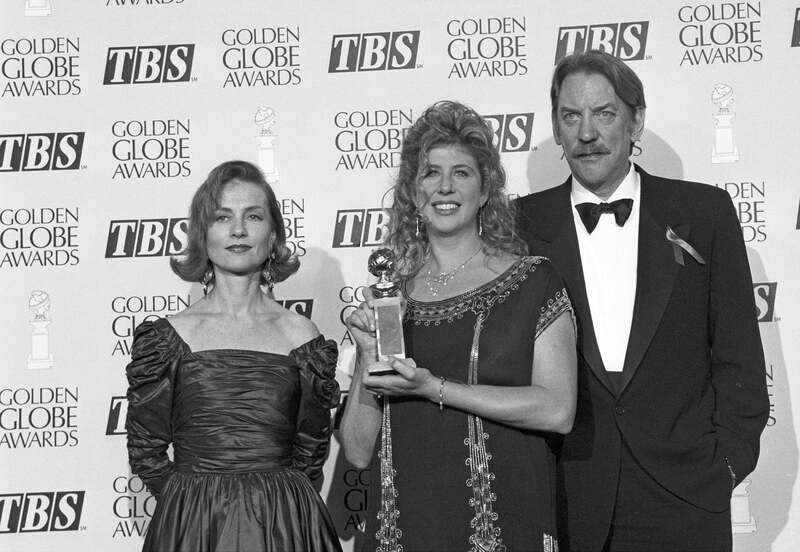 Isabelle Huppert and Donald Sutherland present a Golden Globe for Best Screenplay to Callie Khouri for Thelma & Louise, directed by Ridley Scott, starring Susan Sarandon and Geena Davis, at the Beverly Hilton Hotel on Saturday, January 18, 1992. Callie Khouri went to write Something to Talk About, nominated for a Golden Globe, and write and create the TV series Nashville, which received three Golden Globe nominations. Donald Sutherland was nominated seven times and won two Golden Globes for television’s Citizen X in 1996, and Path to War in 2003. Isabelle Huppert won the Best Performance by an Actress in a Motion Picture-Drama Golden Globe in 2017 for Elle, directed by Paul Verhoeven. Elle also won Best Foreign Film for France.